Aerodynamically shaped with a solid stainless steel nose cone, the flow through design of the Bullet Magnet allows the magnet to be used anywhere in a pneumatic line system. It can be used ahead of processing equipment and bulk load out to assure product purity and protect machinery from tramp metal damage. The nose cone diverter and magnet assembly of the Bullet is designed to maintain a balanced flow through the housing thereby maintaining uniform velocity in line flow. Ideal for dilute phase systems, typical Bullet Magnet applications include: movement of powder and granular flour, chemical, plastic, food stuff, pharmaceutical and mineral materials. There are guide strips within the bullet magnet, which direct the material onto the bullet face. The Bullet Separator has been specifically designed for very quick and easy cleaning, reducing production downtime to a minimum. Star Trace Pvt. Ltd. is a prominent manufacturers, exporters and suppliers of pipelines magnets cartridge Separator and vibratory equipments / cartridge Separators used in various industrial applications. We manufacturers, exporters and suppliers a wide galore of magnetic equipments ,pipelines magnets cartridge Separators such as Magnetic Chip Conveyor, bullet magnet separator, Bullet pipelines separator, cartridge separator, pneumatic separator magnets Pipelines/Cartridge/Bullet/pneumatic separator manufacturers and so on.we are an ISO 9001-2008 company listed in dun & brand street. Specialized in fabrication & manufacturers of bullet magnets separators, pipelines separators, cartridge separators, pneumatic separators. 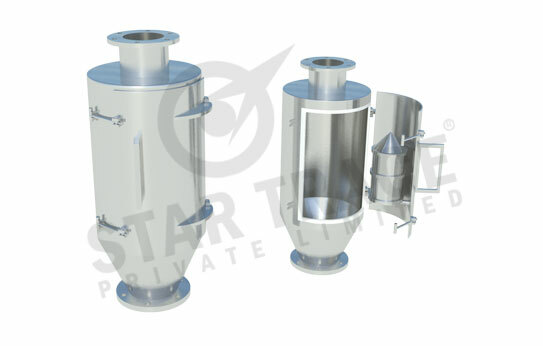 STAR TRACE manufacturers, exporters & suppliers of pipelines Bullets Magnets/ cartridge separator is easily installed with compression type couplings and is available in sizes ranging from 3 inch to 6 inch diameters pipelines. Rare earth Bullet Magnets / separators provide an exceptionally powerful magnetic field to capture fine particles previously unattainable. We are one of the leading manufacturers, exporters and Suppliers of separators like bullet magnets separator, pipelines separator, cartridge separators manufacturers, pneumatic separators, magnetic Bullet & pneumatic separator manufacturers.